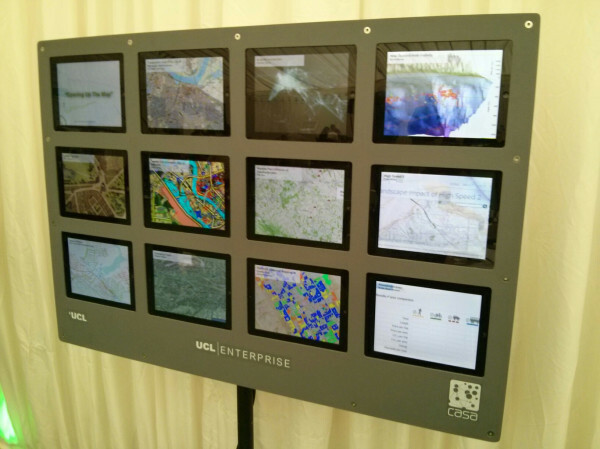 About a year ago I was asked by Steven Feldman, Chair of the 2013 FOSS4G Conference, if I'd be interested in organising and curating a map gallery for the event. I jumped at the chance. The conference was being held in my home town of Nottingham, UK and it was an honour to be charged with helping out my geo-friends. I have worked closely with Rollo Home and Barry Rowlingson, with support from the British Cartographic Society and International Cartographic Association, to get the gallery up and running. We decided early on to go for a 'digital' gallery meaning we weren't going to have walls pinned with paper maps at the conference. This was initially controversial but in the new age of cartography I felt that giving space to new map-makers and focussing on digital media seemed appropriate. Paper isn't dead but this conference, probably more than many, demands the map gallery to move with the times. This was an experiment in some respects but I'm delighted to say that as the conference kicks off it's come together superbly. We've had over 70 submissions and I have to say that as someone who often bemoans the lack of quality in modern cartography, I've been hugely impressed. There are some truly impressive maps and on the whole, the collection represents a time-slice of map-making that showcases the state of the art as it stands. Sure the tools to make maps are progressing at an astonishing rate and maps will mature and become far more nuanced as products but this is where we are at currently. 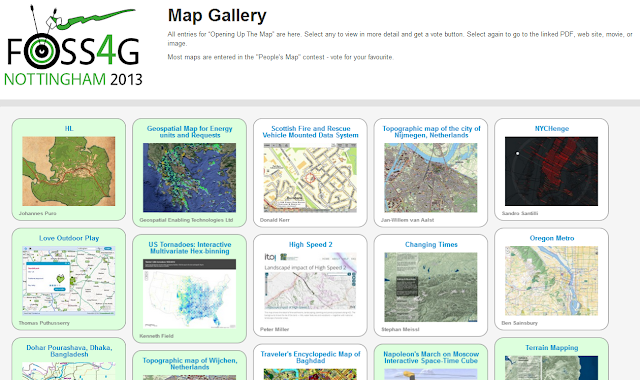 So I invite you to head over to the FOSS4G Map Gallery and take a look for yourselves. You'll find one or two maps you may have seen before and a whole load you haven't. There are maps made by people you're no doubt familiar with and many more from names you're probably going to hear far more of in the coming years. There are a number of prizes on offer for entrants to the map gallery competition. The categories of best data integration, best software integration, best cartographic display, best static map (digital display), best anti-map, best web map application and most unique map have already been judged by an international panel of map experts. The results will be announced during the closing plenary on Saturday 21st Maptember (yes, the month of September has been hijacked because of the sheer number of geo-events taking place in the UK). There is one final prize available though...the People's Award. And YOU can vote too because the voting takes place entirely from the Map Gallery itself. Click on a map you like and a vote button appears. The voting is open to the global community and not just conference attendees so if you like a map...let us know by voting. Voting closes Saturday just before the winners are announced. It's looking like it's going to be a terrific week of geo-fun at the conference. The gallery lives online but is also being showcased in a 20 minute movie streamed via three large plasma screens on site. You can watch the movie on YouTube. We're also extremely grateful to our friends at CASA who have loaned us their iPad wall to display a patchwork of gallery entries. The iPad and plasma screens provide a great way of seeing the range of maps and soaking them up but please VOTE. I'd personally like to thank Barry who has gone above and beyond in developing the technical backend to much of what we can see and use. Thanks. Oh...and in case you're wondering, yes some of my maps are in the gallery because it was open to all but you can't vote for mine even if you were minded to. The last time I organised and then won a competition it ended very badly...student days, pub golf...those who know me know the story and if you catch me at the conference I'll share it with you. I learnt my lesson. A HUGE thanks to all who entered. It's been a privilege to help organise the gallery and good luck in the awards! Mapping election results usually brings out the worst in cartography. The usual default is to map an arbitrary area in a single solid colour showing the winner's affiliation (think red/blue US States). The problem with this sort of approach is the underlying 'real' geography of where people who vote actually live is missing. The map ends up showing a severely distorted geography because it doesn't take account of the population size and distribution and so the map of US elections appears predominantly red even though Obama (blue) won. The counter is often to distort the geography to equalase the underlying problem..such as creating a population density equalizing cartogram (the so-called Gastner-Newman approach). Then there's the dot density approach, hex-binning approach and the dasymetric approach ad nauseam. It's a sort of Dorling cartogram with circles sized proportional to the population in that electoral area and then coloured according to affiliation. The circles are displaced to avoid overlapping but they've added a basemap to at least give some geographical sense to the otherwise abstract representation. I like Dorling cartograms so I am bound to like this effort. The symbols are clear, efficient and unambiguous. 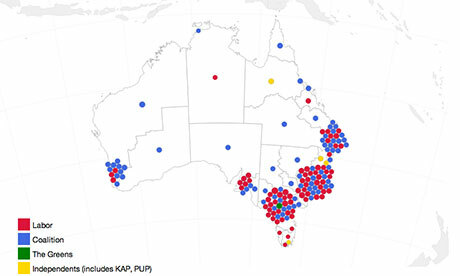 Because of the nature of the population distribution in Australia the map works and the major cities become identifiable (labels would help for people to identify each of the major cities though). In a country that has far more people crammed across more of the actual space the technique wouldn't be as effective. I'd have preferred a larger variation in symbol size (it's difficult to see any differentiation) and a legend to tell me what amount of people are represented by the symbol sizes but kudos to The Guardian who have not simply reached for the defaults and have sought to illustrate the story with something more nuanced and thought through. They've actually showed something sadly lacking amongst many of today's rapid map-making map-makers...they've done some cartographic research and made effective use of it. Even better, their write-up briefly describes their design process and explains why other maps were discounted before they arrived at this effort. Form, function and keeping it simple. Simple! Tube maps. Beck's is beautiful. One or two others work. I currently have a collection of over 170 copies, parodies, imitations and fakes; most of which are just tedious. Simon Patterson published The Great Bear in the early 1980s which kicked off the craze of using the Tube map as a canvas on which to hang your own crazy idea. I gave a talk at the International Cartographic Conference on this very issue as myself and collaborator Professor William Cartwright feel it's time to leave the map alone (slides here). 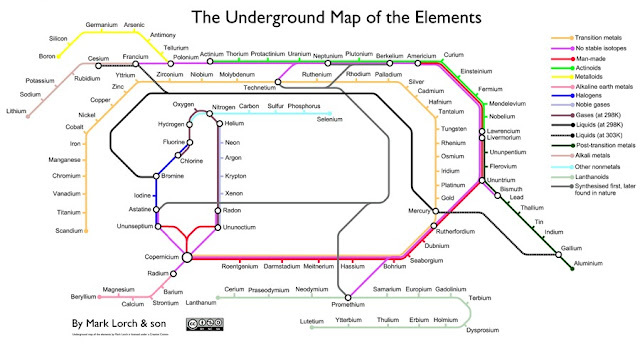 It's a tube map of the elements in the periodic table. There's a write up in The Guardian. It's a map made by Mark Lorch, a Senior Lecturer in Chemistry at University of Hull. Now I don't want to be too disparaging because no-one likes criticism but in my opinion this guy has clearly spent too long in the fume cupboard. What was he thinking? The periodic table is a masterpiece of clear, efficient design that captures the organisation and relationship of the elements perfectly. Dmitri Mendeleev is credited with the first fully published version in the mid 1800s and, like Beck in the 1930s, clearly took cues from previous work but sprinkled a bit of magic to create a definitive masterpiece. If you are going to have a stab at re-designing such a classic start with a blank canvas and think creatively. Instead, Dr Lorch decided to plagiarise Mr Beck's work and use it as a basis for this Frankenstein of a tube map derivative. Many have done so. Most fail but at least they are usually trying to make a map of some humourous nonsense. This plumbs new depths as it takes two classics, rides roughshod over one while destroying another. A few years ago such nonsense would have never seen the light of day but now it gets top billing on The Guardian's web site for all to see and it's already racking up the obligatory likes, re-tweets and suchlike. h/t to @Jon_Two and @williamscraigm for ruining my morning by alerting me to this. The British Cartographic Society is holding its 50th Anniversary conference in Leicestershire, UK in 2013 (now, as I write). Their very first get-together was in Leicester and so, reasonably, the desire was to return for the 2013 celebration. 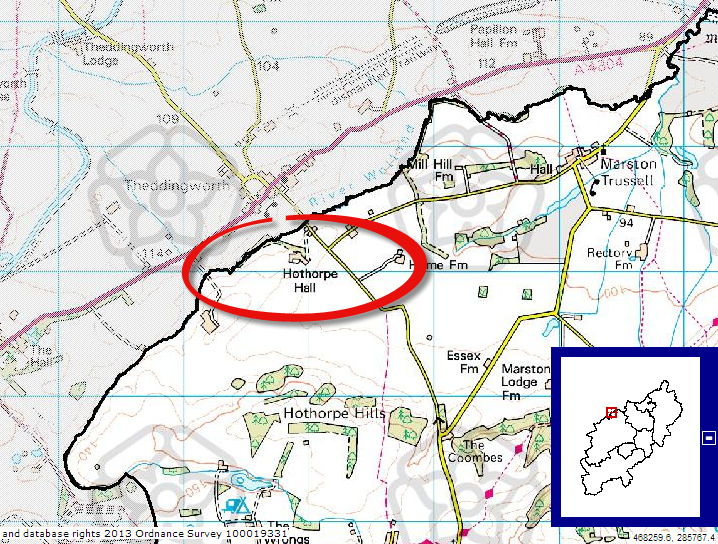 The venue is Hothorpe Hall...whose postal address is in Leicestershire except someone forgot to check the map because it's actually in Northamptonshire, its southerly neighbouring County. Can there be a more delicious slice of cartographic irony for a mapping conference? That thick black line represents the County boundary between Leicestershire (to the North) and Northamptonshire. 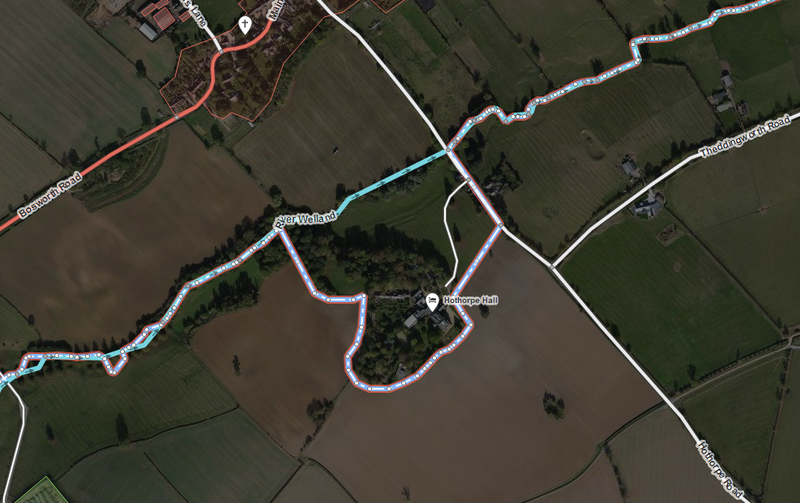 The River Welland is the border and flows about 50 yards north of Hothorpe Hall itself. There...everyone can relax and get on with the conference which is now, according to the latest digital mapping technology (so it must be right...right? ), back in Leicestershire. It seems that Autumn in Europe in 2013 is awash with geo-conferences. The International Cartographic Conference (ICC 2013) in late August is the forerunner for a further 12 geo-focussed conferences in the UK alone! Has there ever been such an explosion in interest in geospatial and mapping as now? Only a weekend separates ICC 2013 in Dresden, Germany from the Society of Cartographers who hold their annual summer school in Stoke-on Trent 2-4th September. The British Cartographic Society holds its annual symposium 3-5th September in Leicestershire. The other major conferences in September include State of the Map (6-8th, Birmingham), AGI GeoCommunity (16-18th, Nottingham) and FOSS4G (17th-21st, Nottingham). There are a further eight conferences in what is being called Maptember (yes, there's even a web site). It’s a great name for a month of conferences but is it too many? I've just returned from ICC2013 in Dresden which was terrific and supremely well organised. Over 1400 people converged on Dresden for a great set of scientific and technical papers, a great exhibition and map gallery. It kicks off a 6 week marathon for some and I'm now camped in a hotel awaiting my next dose of Maptember...Society of Cartographers in Stoke. I'm tired already though...my 8 day stint in Dresden included giving several papers, displaying my work in the gallery, giving demos on my employer's booth, meeting people new and old, running a pre-conference workshop, chairing sessions and meetings as well as getting involved in the social side of the conference. I'm fortunate to be able to attend a good number of these events and ICC was one of the most rewarding of recent years. For many though, their employers, personal circumstances, finances and energies will mean they have to pick and choose wisely and inevitably they will miss some great stuff. For some, the nonsensical clashes that arise mean that geo-conferences are effectively cannibalising each other. I cannot go to them all either and I have some sympathy with the view that there are simply too many. I'm planning to attend ICC, SoC, BCS and FOSS4G. I simply cannot justify the time and cost to stop by any more...and I doubt I would have the energy anyway. And from a good number of people I spoke to in Dresden many are unable to go to all they would want. Whilst it's nice to think of Maptember as a geo-carnival this has the potential to be a major headache. Let me give you an example that goes beyond Maptember in 2013. It’s been said before by many but quite how the Society of Cartographers and the BCS manage to find a way to hold their conferences across virtually the same days is baffling and a real shame. Yes, for each there are perfectly good reasons why certain dates are chosen. They are understandable on their own merit. But clashes happen regularly and is a constant source of irritation to many who do want to actively participate in the two main UK conferences that focus solely on cartography. Vanessa Lawrence, CB, Director-General and Chief Executive of Ordnance Survey (UK) has expressed these concerns before and for many in the UK in particular, it’s time to explore ways of accommodating the wishes of those who would like to attend both conferences as much as the wishes of those who seem intent on keeping their separate identities but who seem unable to make their events mutually exclusive. There's perfectly good reasons why both SoC and BCS might have wanted their conferences in September this year. And yes, they both probably sought to avoid the ICC week and other Maptember events but it’s time to put personalities, histories and politics aside and focus on supporting a strong, vibrant industry going forward that has its members and practitioners at its core. Mapping is bigger than ever and our societies need to be prepared to adapt and accommodate change themselves to remain able to represent and lead. A good start would be to avoid the same dates where possible. I had to, unfortunately, withdraw a paper from one conference because of a clash and the need for me to pick rather than try to be in two places at once. I'm sure I'm not alone. Only time will tell whether the dozen or so conferences in Maptember will lead to geo-burnout for attendees. Maybe there should be a prize for those who manage to attend all of the different conferences...and possibly a bigger prize for anyone who finds a way to rework the same paper to give at all the different events. How many times do we see a map then up pops another using a very similar technique soon after. Only a couple of weeks since we saw Block by Block, Brooklyn's Past and Present which mapped building age in Brooklyn and now we have The Netherlands mapped in a similar way. I wrote a blog called Taste the Rainbow which explored the problems of mapping sequenced data using a qualitative colour scheme and so this is a follow up, second helpings if you will, that comments on the colour on this new map. The Brooklyn map used a full spectral colour scheme and the point I made in the previous blog was simply that there was no way you could see any date sequence in the map with that colour scheme. 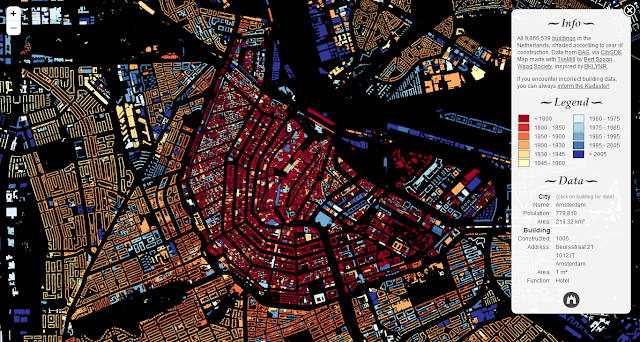 Made by Bert Spaan, the map of The Netherlands makes pleasant viewing with highly saturated colours on a dark background. Only the buildings are shown so the structure of the city gives the map its structure. No other data is necessary. It resamples a little as you zoom out but quite honestly at smaller scales the map doesn't have much impact. There needs to be some aggregation of the data and new symbolisation applied. At larger scales the individual buildings can be seen (and queried). The use of colour on this map is certainly an improvement on the Brooklyn map. It uses a dichromatic colour scheme so we can see (a) buildings that share similar construction dates and (b) how neighbouring buildings are dated in relative terms. Dark reds move into oranges into yellows. But there are still problems. The colour scheme then goes into light blues and then onto dark blues. Why use dichromatic? There's no obvious reason why red should be old and blue should be new. Why not just use a single hue in a sequential scheme, light to dark? Then we could genuinely see at a glance older to newer. Don't get me wrong...this map makes huge strides over the Brooklyn one and corrects the basic errors made. It just seems to still want to use lots of colour when actually, a brevity of colour and a more judicious use of lightness and saturation would give a map that communicates the key information more easily. Is this an example of the map-maker wanting to use a full palette because it grabs attention more? Possibly. Throwing colour on a map is easy. It doesn't always do the data or purpose justice though.